Saturday 25th to Thursday 30th, this includes the Cotswold Festival of Steam Gala. [update 20/12/18] Following from a successful autumn in service on the GSWR No. 6 P&O was due to be rested until new year, however she is now scheduled to be operating from today 20/12/18 (on Santa Specials until 24/12/18) through to January 1st (except Christmas Day). This is due the ex GWR 28xx No.2707 on the GWSR having piston problems. [update 08/08/18] Following a couple of weekends of service in July and a splendid members evening on the 14th July, with a very spirited run from Broadway back to Toddington, No. 6 required a replacement for a broken front bogie axlebox spring noticed during a routine inspection of the loco. Particular thanks go to our friends at Southern Locos in Swanage for agreeing to loan us a new replacement spring, thanks also to our Bulleid friends at the Mid Hants, Clan Line, Sellinge and Bridgenorth, for also offering help with a replacement spring ! Changing out the actual spring took just 1 1/2 hours, on the indoor pit. The spring which broke was an original spring fitted by British Rail back in 1959. 35006 is currently restored for steaming this month on 18th, 19th, 21st, 22nd, 23rd, 24th and 25th. [Update 08/05/18] Due to a new piston ring being needed on Foremarke Hall, 35006 is stepping up to the plate during May and will running services on the following dates: 09, 10, 12, 13, 19, 20, 26, 27, 28, 29, 30, 31. [Update 05/03/18] It is good to report that 35006 passed her pre-season steam test and boiler examinations last week in readiness for her being rostered on Race Course Charter services between Tuesday 13th and Friday 16th March and on standard GSWR services over the weekend of 17th and 18th March. [Update 25/09/17] Following her excellent spell in regular service on the GWSR during August, 35006 is booked to be running for (at least) one more weekend this year, with its use confirmed for 21st & 22nd October. The loco is the standby engine until then and with loco availability quite low at the moment, it could be called upon for extra duties. As usual, everything might change at the last minute. [Update 30/07/17] After a successful spell on the Mid Hants at the beginning of the month for their Summer Gala, commemorating 50 years since the end of steam on the Southern Region, 35006 has returned to the GWSR and is being warmed ready for turns in service this coming week from Tuesday 1st August. [19th May 2017] Further to my update of 8th May below, things change quickly, 35006 was additionally steamed and running services on 16/17/18th May but now a problem with a repair carried out to P&O in the early days has caused P&O to be stopped until a new repair can be carried out. The Society will be starting the repair tomorrow, which will most likely require a new machined part and specialist welding, 35006 will not now be running this weekend nor during next week. [8th May 2017] After a successful steaming in March for a series of Private Charter trains in conjunction with the Cheltenham Races Festival, now allocated dates for her running on the GWRS during May have been released. The steaming dates commence this weekend 13th/14th May followed by the weekend of the 20th/21st and then Tuesday, Wednesday, Thursday 23rd to 25th may leading up to the GWRS’s Cotswold Festival of Steam over the weekend of Saturday 27th, Sunday 28th and Monday 29th May. Of course these dates are all subject to the usual caveats of the availability of the loco and other factors on the line itself, so it is best to check before you visit the line. [15th March 2017] Following a winter of maintenance and having successfully passed its annual steam testing earlier this month, 35006 is one of the rostered engines this week 14th to 17th March for a series of Private Charter trains in conjunction with the Cheltenham Races Festival. She will then be then out of service, unless required due to a failure of one the Gloucestershire and Warwickshire Railway’s (GWRS) other engines, until the GWRS’s Cotswold Festival of Steam over the weekend of Saturday 27th, Sunday 28th and Monday 29th May. I have also at long last finished my model of 35006 in her as preserved condition, details of which can be read on my blog post here. [7th September 2016] The first three months of running service trains during the high season for the Gloucestershire and Warwickshire Railway (GWSR) has now taken place. On the whole this has been a great success with only a couple of issues, which after such a prolonged restoration is to be expected. The first issue was caused by the failure of a seal on one of the tender brake cylinders which was duly replaced and no such trouble repeated itself. The second issue caused 35006 to be taken out of service for a few days as it was causing one of the injectors not to perform, which required the investigation to be carried out when cooled down (that takes up to 48 hours) after a few false dawns and re-steamings (that takes 36 hours) the issue was finnally isolated to the seat on the clack valve which was again fixed and subsequently she performed all that was requested of her. Congratulations to all the loco operating team at the GWSR and also thanks to other Bulleid Pacific owners whom provided advice and support. The 2016 operating season for scheduled operations is now over unless she is needed as a substitute for another locomotive on the line. [16th May 2016] following a series of trial runs and loading tests over the last few weeks, today 35006 is renamed (by Pete Waterman, President of the Gloucestershire and Warwickshire Railway) and hauls her passenger train for over 50 years for members and shareholders of the 35006 Locomotive Society. A post about the day and further pictures can be read here. [8th February 2016] The 35006 Society have won the Heritage Railway Association’s John Coiley Award for the restoration of 35006, congratulations to all those involved! [21st December 2015] 35006 steams again as 3 cylinder locomotive again! Society member Chris Ardy has produced a video of the event. It is understood that at least some of the excess steam was coming from a cylinder pressure relief valve that was opening at too low a pressure. [10th August 2015 – Great news:] 35006 was steamed today, at the Society’s members day and moved under her own power, albeit minus the middle cylinder connecting rod, for the time in 51 years! Congratulations to all involved. Just need to keep up the pressure now on fundraising and new members to complete the final fittings, finishing touches and keep her steaming. In December 1941 Merchant Navy class locomotive number 21C6 was rolled out of Eastleigh Works, later to be named Peninsular & Oriental S. N. Co. after the famous shipping line. 21C6 was unique amongst the Southern Railway Merchant Navy pacific’s in that she spent her entire working life allocated solely to one shed, namely Salisbury. She was also unusually paired with the same tender throughout too. After Nationalisation in 1948, 21C6 was renumbered as 35006. 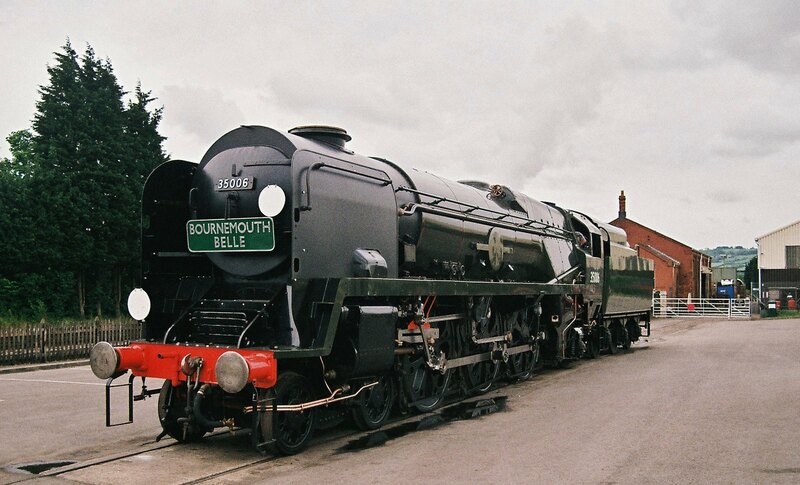 All examples of the Merchant Navy class were rebuilt along more conventional lines, with 35006 and 35028 Clan Line being the last two examples to be modified in 1959. In August 1964 it was all over; due for a heavy general overhaul, 35006 was withdrawn and at first cannibalised for spare parts before her sale to Woodham Bros scrap yard at Barry in South Wales. Thankfully she now is undergoing restoration to full working order by the The 35006 Locomotive Company Ltd based at Toddington, the principal station of the Gloucestershire Warwickshire Railway. 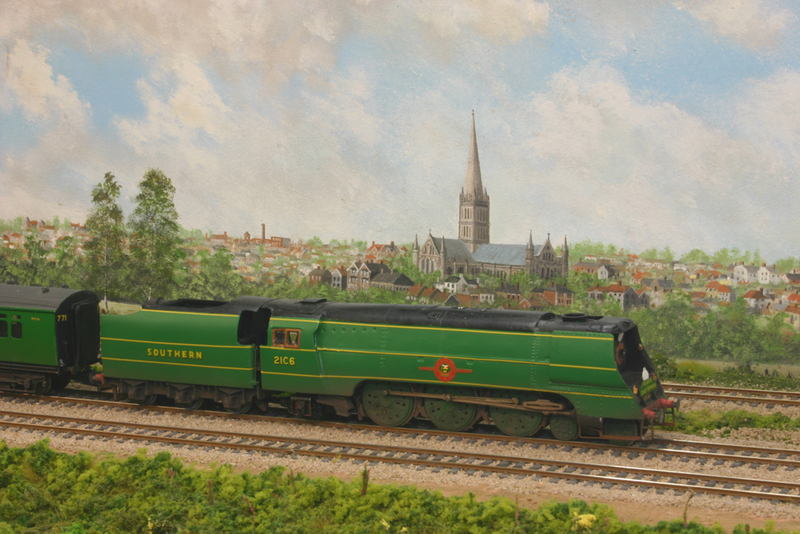 The company is supported by the 35006 Locomotive Society which has approximately 330 members. 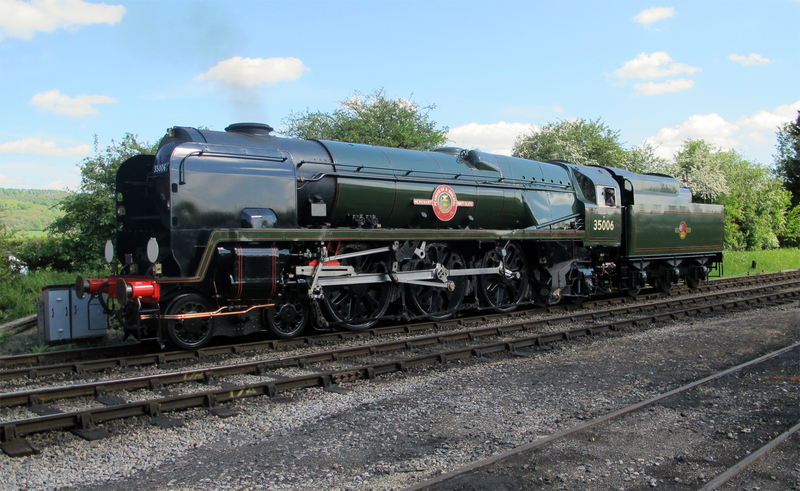 [update July 2015] Progress continues to be made, as can be seen from OG47’s image left from Flickr, and it great to be able report that 35006 passed here formal steam test with the insurance company on July 13th 2015. In other news the first of the connecting rods has now been fitted (the one on the firemans’ side) and the loco was moved up and down to check that the piston moved correctly in its cylinder. Work is under way to press the big end bearing into the second rod (the drivers’ side) before tackling the tricky job of getting the middle rod in position. Society membership costs £12 per year (at the time or writing) and society members receive an excellent quarterly newsletter, which includes a full and detailed report on the progress of the restoration work. Further details on the running in service of 35006 can be found on the Gloucestershire Warwickshire Railway website. will you be there on the first public steaming sometime this year Graham? As a shareholder I certainly hope so! Hi Graham! I am a huge fan of your model railways! Is Ashland yours as well? My dad and I are also shareholders in 35006, and we were last up at Toddington in May for a shift on the footplate whilst she was on show during the Cotswold Steam Celebration. I am currently planning to build an exhibition model railway, at the moment I am looking into basing it on Holworthy and came across Ashland. I would love to see some more pics of it for ideas and just to see how it has been done. Many thanks for your comment. Ashland technically belongs to Mike Wild the editor of Hornby Magazine as Mike, Richard Proudman and myself built .it over the weekend of the Hartlepool Hornby Magazine Live show in 2011. The way it was built was featured in the magazine around the same time. 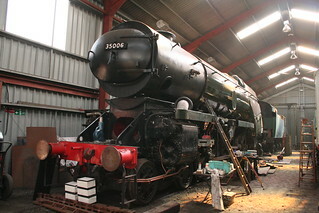 I have been enjoying the progress made at Toddington with 35006 and look forward to her steaming soon. How would I go about joining the society is it a case of just writing to them and they send you an application form? Yes pretty much the way I’m afraid, but worth it. Thanks for great day and for inviting me to the Do. Was that your tender going north on the M40 tonight? My husband has shares in 35006 but since moving house we can’t seem to find out where to notify the company. Any ideas?